Lighthouse 360 is the leading patient communication system for dental practices, and is ideal for practices looking to reduce cancellations and no-shows, and reactivate inactive patients. Lighthouse 360 (LH360) is a popular patient communication system that was designed specifically for dental practices. The founders of Lighthouse have a strong understanding of what it takes to optimize a dental practice -- they also created PracticeWorks, a popular dental practice management system that was acquired by Carestream Dental in 2003. The creators of Lighthouse created PracticeWorks in order to fill the gap in patient communications left by current PMS systems. Currently, Lighthouse 360 is used by more than 11,000 dental practices, making it the top patient communication option designed specifically for dentists. It is also the winner of the prestigious 2017 Dentaltown Townie Choice Award for Patient Communication Systems. As a leader in the patient communication software space, Lighthouse 360 continues to develop new features to improve its product. For example, in late 2017, Lighthouse 360 launched its new "Fill-In" feature, which helps to fill in last-minute cancellations and unexpected schedule openings. In addition, in early 2018, Lighthouse released its new paperless forms feature, called "Patient FastTrack". One-time startup fee of $299. LH360 was designed specifically to help dental practices communicate efficiently and effectively with their patients. The company was acquired by Yodle (now Web.com) in 2013, and since then, it has attempted to expand to other industries such as chiropractic and auto repair. However, it seems that the company has scaled back on those efforts, and decided to keep their focus on the dental industry. Lighthouse 360 is best known for its patient recall & retention capabilities. The system integrates with many popular dental practice management systems, including Dentrix, Open Dental, Curve Dental, and Denticon. LH360 syncs with your practice management system every 10 minutes, to make sure that Lighthouse has the most up-to-date data. This helps to avoid sending text reminders to patients who recently cancelled their appointments, for example. Below, we'll discuss some of the key features of Lighthouse 360, and how they can benefit your dental practice. Lighthouse 360 has various capabilities that help increase patient recall automatically. For example, Lighthouse can automatically integrate with your practice management system to detect if a patient has a treatment plan, and send reminders to patients accordingly. If patients have scheduled appointments, Lighthouse 360 can send them automatic appointment reminders through text, email, postcards or automated phone calls, which LH360 claims reduces no-shows by an average of 40%. Note that postcards and phone calls come with an additional charge. One of Lighthouse 360's major selling points is its robust messaging capabilities, which enable you to create custom messaging schedules that help you follow up with patients at various points prior to their appointment. For example, if a patient doesn't confirm their appointment after your first message, you can schedule to have subsequent messages sent on future days, through a variety of mediums, until they ultimately confirm their appointment. This helps maximize the chances that your patient shows up for their appointment -- otherwise the patient may miss your initial message, or simply forget to respond. If a family has scheduled multiple appointments on the same day, you can send one appointment reminder to one person, instead of sending multiple messages to each individual member. This is a nice personal touch that shows that you understand your patient's needs, and avoids needlessly bombarding your patients with too many messages. After a patient finishes an appointment, the system will send him/her an email that requests that he/she fill out a review for your business on your preferred reviews site (Yelp, Google+, etc.) 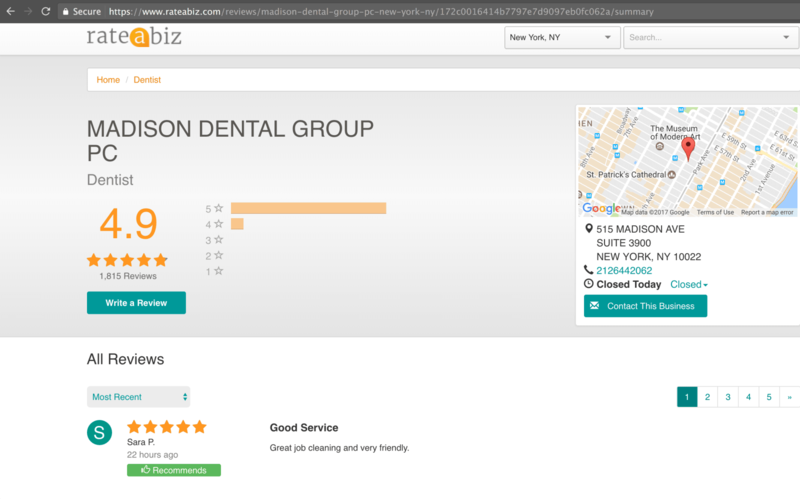 You will also get your own reviews page on RateABiz.com, which is a reviews site owned by Yodle. Lighthouse provides a widget that integrates with Facebook, so that reviews from RateABiz will automatically display on your Facebook page. This saves you the time of manually updating your page with new reviews. Soliciting reviews is an important step in managing your online presence and will go a long way in increasing your perceived credibility. These are important factors that potential patients take into consideration when trying to decide between several dental practices. Lighthouse also provides a widget so that you can display your reviews from RateABiz on your own website. Lighthouse 360 is also intended to simplify your staff's workflow. Each employee can manage a task list to remind them of various things that they need to do throughout the day, and help keep them focused. 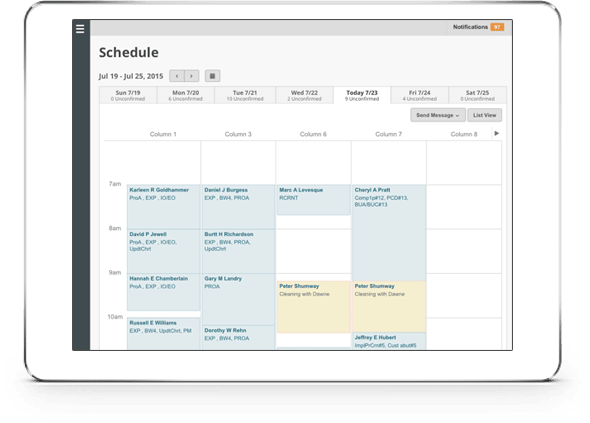 Staff members can also access their schedules online, which is especially important if your practice management system isn't already web-based. Another added benefit is that since most reminders will be sent through the system automatically, your staff will spend less time following up with patients by phone, email, or other means. Lighthouse includes basic reporting capabilities that provide more insight about your patient demographics, as well as your business's performance. For example, you can better understand who your new patients are (broken down by age, gender, zip code, etc.). You can also understand how efficient your scheduling has been, by seeing how many appointments have been scheduled, cancelled, or completed. Lighthouse added its "Fill-In" feature in late 2017. With this feature, when there are last-minute cancellations or unexpected gaps in your schedule, the system will identify patients who are likely to want the available slot. Lighthouse can then send them a message, letting them know that this last minute availability opened up, so that they can reserve the slot. Since these time slots would otherwise go unoccupied, this feature helps ensure that your schedule remains full, and also provides as many patients as possible with the opportunity to see you when they want to. In early 2018, Lighthouse released its HIPAA-compliant paperless forms feature, known as "Patient FastTrack". Patient FastTrack works by sending patients a text message before their appointment, which asks them to fill out their forms directly on their smartphone. This information is then sent to your Lighthouse system, so that you'll have access to the patient's forms when they arrive for their appointment. Not only do paperless forms save patients time compared to traditional paper registration forms, but they also save your staff time, since they won't have to manually enter the patient's information into your practice management software. From the patient's perspective, paperless forms give your dental practice a more professional and modern feel, which plays an important role in providing your patient with an exceptional experience. How does Lighthouse 360 compare to other automated patient communication systems? Below, we'll compare Lighthouse 360 against some of its competition. Both systems offer similar functionality and are popular amongst dental practices. But the two systems have different pricing structures. In particular, Lighthouse 360 has a lower monthly fee at $329/month without any long-term contract, compared to Solutionreach's $379/monthly fee, which requires a long-term contract. Though the difference in monthly fee may not be that substantial, Lighthouse's month-to-month pricing is a substantial advantage, especially given that many users report having issues with Solutionreach's contract, which auto-renews at the end of each period. If you're just comparing the base prices of both systems, Lighthouse 360 comes out on top. Though the base systems offer similar functionality, Solutionreach has powerful add-ons, such as its Conversations and Limelight modules which offer capabilities that you would otherwise have to purchase from other vendors. For example, Lighthouse doesn't currently offer online appointment scheduling, so if this is something you'd like to offer your patients, you'll have to pay for a system like LocalMed or Zocdoc, which will cost an extra $250-$300 per month. In contrast, if you purchase Solutionreach's online appointment scheduling module, Limelight, it will only cost an extra $80/month, so the total package can end up being more affordable. However, Limelight's scheduling capabilities may not be as robust as LocalMed's, and Zocdoc can help provide exposure to new patients through its platform, whereas Limelight won't. As with Solutionreach, Demandforce requires users to commit to a long-term contract. However, its monthly fee of $299 is a bit lower than Lighthouse's $329/month price. In terms of price, the difference is negligible, especially since Lighthouse 360 doesn't require any long-term contract. Both Lighthouse and Demandforce offer similar core functionality and integrate with many of the most popular practice management systems. The two systems both have many satisfied users and are very popular in dentistry, so ultimately your decision should boil down to personal preference, and how user-friendly you find each system to be. Is Lighthouse 360 right for you? If you're looking to increase your patient recall, then Lighthouse 360 is a top option to consider for your dental practice. Many practice management systems offer this functionality for an additional charge as an add-on module, but may not offer all of the functionality that Lighthouse 360 provides. After all, Lighthouse's main focus is patient communications -- in fact, it was designed specifically for that purpose. In contrast, a PMS system that sells its patient communication capabilities as an add-on module will not place those features as their top priority. The $329/month price tag may seem steep, but users report that it's well worth it, and Lighthouse has a lot of data that suggests that the system can easily pay for itself by bringing in additional revenue through patient recall and reactivation. In addition, since Lighthouse integrates with many popular dental practice management systems, using Lighthouse won't introduce as much of the overhead that typically comes with managing multiple software systems simultaneously. However, if your current PMS system doesn't integrate with Lighthouse 360, then you're better off finding a patient communication solution that supports your practice management system, or paying for it as an add-on module through your existing PMS. In addition, if you're looking to enable patients to book appointments online, you'll have to consider another system such as Demandforce or Solutionreach. To learn more about Lighthouse 360, you can visit their website here.